A very physical first half ended up with a 33-33 tie. Purdue shot nearly 38% percent and the Wildcats hit on nearly 42% of their shots. 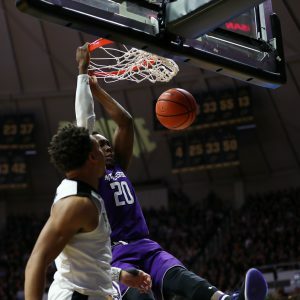 Purdue was seven of twelve at the charity stripe while Northwestern had yet to attempt a shot. Purdue had outrebounded Northwestern 22-21 at the intermission. The second half opened up with another Donny brook in store, as both teams went toe to toe with one another. Both Northwestern and Purdue made runs but neither could open up more than a four point lead on each other. One of the key plays for Purdue happened at the 4:43 mark with the Wildcats up 55-53. Haas was at the line and his free throw bounced off the rim to the left side where Senior P J Thompson came up with a rebound and fed Senior Vince Edwards the ball who hit a shot from 15 feet out to tie the game up again at 55. Purdue would pound the ball relentlessly to Haas who responded with monstrous dunks and draw fouls before cashing in on the attempts. Another huge player for Purdue was Carmel, Indiana Junior Ryan Cline who found his stride in 25 minutes of action by hitting five of seven field goals, that included a three of four night from behind the arc. Purdue went into the game with keeping Greensburg, Indiana Senior Bryant McIntosh in check and in check he was. McIntosh was stymied as other Wildcats had to step up and forced them into making big plays. Northwestern had big games from Dererk Pardson, Junior, Cleveland, Ohio with 20 points and eight boards, steady senior guard Scottie Lindsey added 17 and red shirt junior Vic Law added 12 points, 10 rebounds and four assists. No other Wildcat scored in double figures though sophomore Isiah Brown scored nine points, seven over his average. For Purdue, a hard earned win, continuing the win streak that started with Arizona. 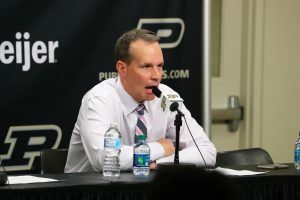 Issac Haas led the Boilers with 26 points and a team high nine boards, Cline scored 13, Edwards 12 and eight boards, Dakota Mathias nine points and a team high five assists. Carsen Edwards would add six points and four assists. Purdue now entertains in state Valparaiso while Northwestern host Chicago State. 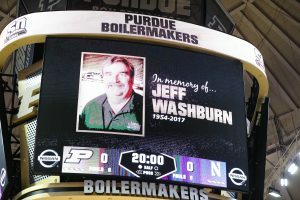 Note: Purdue University had a nice moment of silence for Jeff Washburn, who passed away recently.